I apparently have two speeds when it comes to this blog, over productive and complete slacker. I truly apologize for that. It’s been a crazy few weeks. Between snow storms, everyday tasks and studying for my certification, I’ve been highly overwhelmed and stressed. When I get that way, I try to remove things from plate that aren’t essential to day to day living, so blogging tends to take a back burner, which I hate, because I enjoy doing it. With that, I’ve still been in the kitchen and sticking with clean eating (with the exception of the Papa John’s Pizza and the burger I had while at Super Bowl Boulevard the other day – more on that soon) and I have a new recipe to share with you! I found the inspiration for it on Pinterest of course. 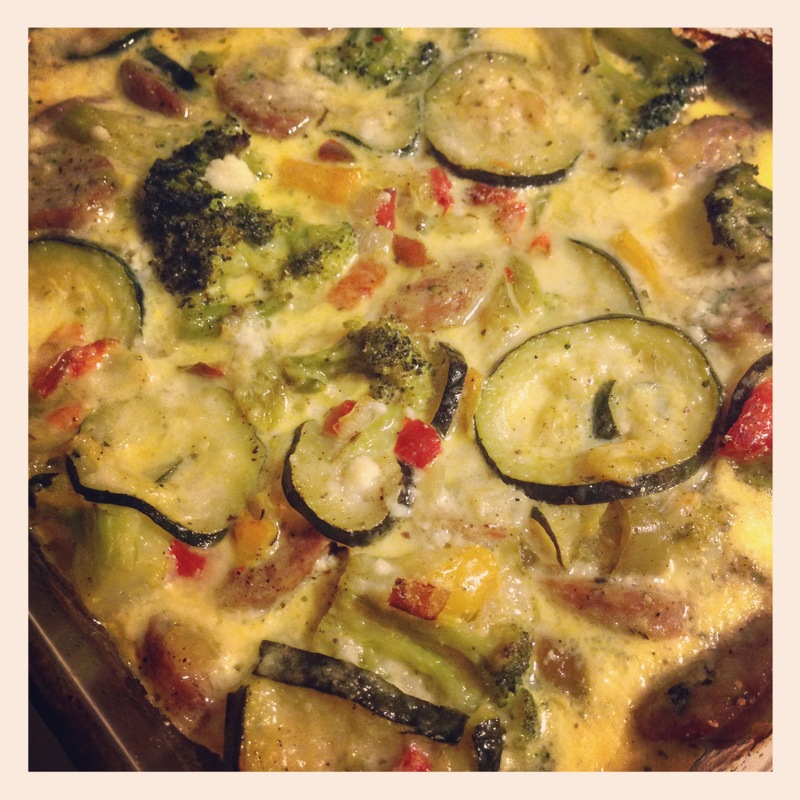 It’s more like a crustless quiche than a casserole but I’ve never made a quiche so I can’t say for sure, therefore we shall call it a casserole. 3. Grease an 8×8-inch baking dish and set aside. 4. Heat the olive oil in a large skillet over medium-high heat. Add onions and a pinch of salt and saute for about 2 to 3 minutes until translucent. Add broccoli florets, zucchini, pepper, black pepper, ½ teaspoon of salt, red pepper flakes and about ¼ cup of water. 5. Cover with a lid and cook for about 15 to 20 minutes stirring often. The vegetables should brown a bit and must be thoroughly cooked, but still retain some of their crunchiness. Turn off the heat and let cool for 5 minutes. 6. In a large bowl whisk eggs, milk, ¼ tsp of salt and nutmeg for a couple of minutes until fluffy. Add chopped basil and stir to combine. 7. Add the sausage and vegetables to baking dish and spread them on an even layer. With the back of a spoon press them down gently. 8. Pour the egg mixture over the vegetables and sprinkle with Parmesan cheese (if desired). 9. Bake in the oven for about 30 minutes, until a skewer inserted into the center comes out clean. This was a quick a simple recipe to make. You could add any vegetables you have on hand to it and you could even use chicken if you prefer. I was craving sausage and peppers but I didn’t want to have bread or pasta, so this worked out perfect. I haven’t tried too many new recipes lately. Since I’ve been so pressed for time, I’ve been sticking with what I know and keeping meals very simple. If you have tried any new recipes that you loved, please send me a link to them! I’m always looking to try new things.